Anyway, that's my plan and I'm sticking to it! 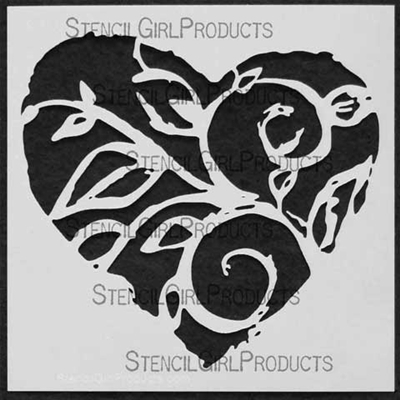 So... like many of my pieces, I don't begin with a plan other than which stencil I choose to work with and in honor of Valentine's Day I picked out the Heart Swirl stencil designed by Margaret Applin as my focal point and then the rest just fell into place intuitively. 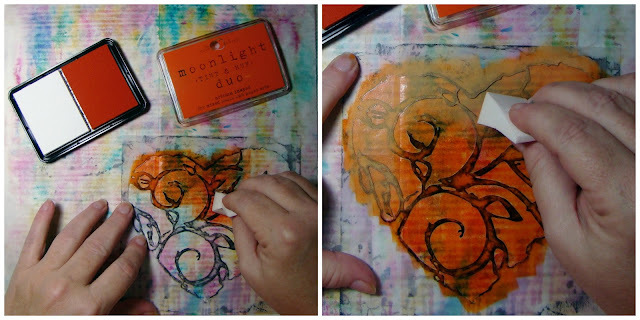 I sponged ink through my stencil because I felt that I should keep my page "light & airy". Since I was working on a piece of deli paper that's translucent I believed that acrylic paint would be too "heavy." I suppose "fragile" was long in my head before I even knew what words I was going to use. Even using the white ink to lighten up the orange fit into my delicate theme of mind. It's funny how things flow together sometime without meaning to do it. The butterfly washi tape caught my eye because of the colors, and I needed something to hold the strip of paper in place that I added while I sewed it together, but now as I write this I realize that butterflies are deep and powerful representations of life. Many cultures associate the butterfly with our souls. And this page is all about feelings and how ones' soul can affect another soul...and how my soul affects my art. Part of working intuitively is to trust yourself and take your time. 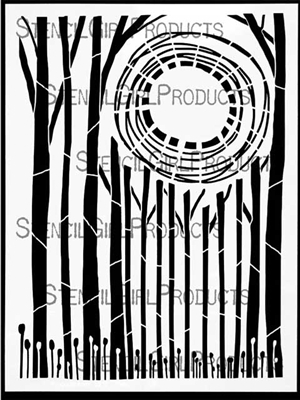 Sewing slows me down and gives me time to meditate on what I'm working on. To feel the texture of the paper, to hear the sound of needle meeting paper. I love to sew on my art for 2 reasons. 2. It gives me texture without adding bulk to my art journal. I prefer them to lay flat. Allowing yourself to be open to "play" is also an important part of expressing yourself. I have fallen back in love with embossing powders once again but using them differently. 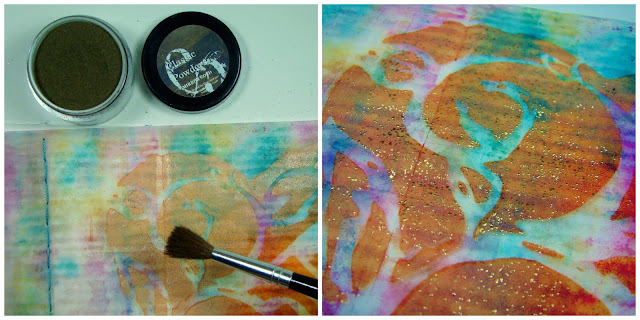 I have discovered many ways they can add texture to my art journal page like splattering the powder over wet paint or ink, much like one would do with paint. The effect is amazing. But of course the old tried and true effects of edging word strips with embossing powder still holds a place in my heart that beckons me way back to my scrapbooking days! I added some phrases I thought would portray my message and by layering them under the side strip of deli paper that I had sewed onto the page, they became softer, less judgemental. The last step was to adhere the page into my journal with some decoupage and I felt done...completed...satisfied...happy. 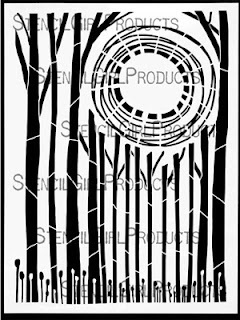 The background paper came from my stash of mono-prints that I made during a previous post. You can check out the video tutorial by clicking on the link below. Love your process and project! And you crack me up! Love it! Especially like your stitching and the way you describe your "theme of mind." 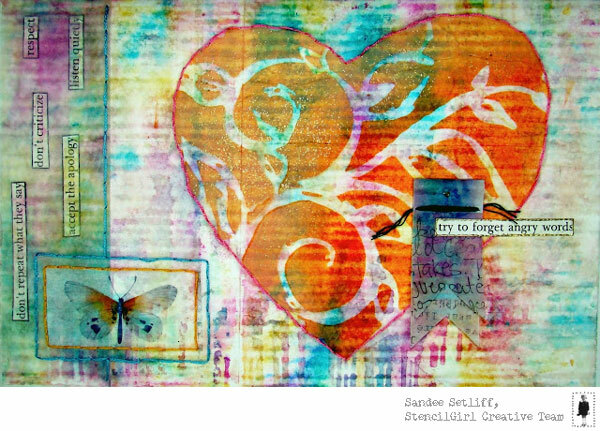 BEAUTIFUL post, BEAUTIFUL project, BEAUTIFUL stitches and a two BEAUTIFUL hearts - yours and your creativity! Xj. Love love. Great as always ..
Amazing artwork, and so meaningful! So strange not seeing the anti Valentine treat from you!! I love all the intricate pieces and the stencil is awesome!!! So poignant Sandee. Beautiful pages and thoughts. I think your new tradition is a good one and I may just join you!